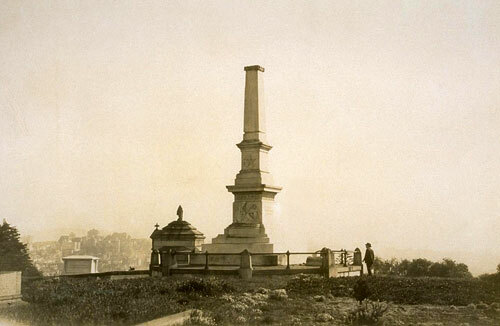 The builders of the West, civic and military leaders, jurists, inventors, artists and eleven United States Senators were buried here -- the most revered of San Francisco's hills. 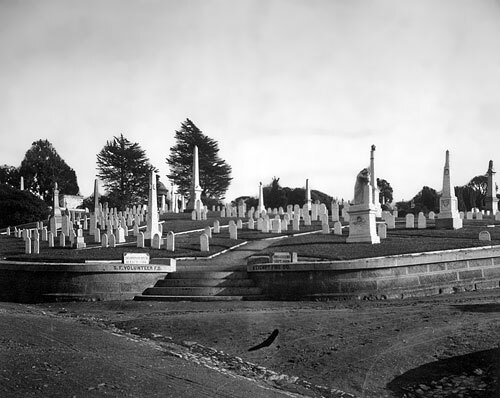 Lone Mountain Cemetery, named after the towering sandhill just south of Geary Boulevard, opens for business on May 30, 1854 and its first tenants take up lodging three days later. A year earlier, a group of San Franciscans, with profit in mind, had purchased fifty-four sandy acres bounded by today's Presidio Avenue, California Street, Geary Boulevard, and Parker Streets. The venture is so successful that during the next decade, three other cemeteries are founded on the slopes adjacent to Lone Mountain: Odd Fellows, Masonic, and Calvary. 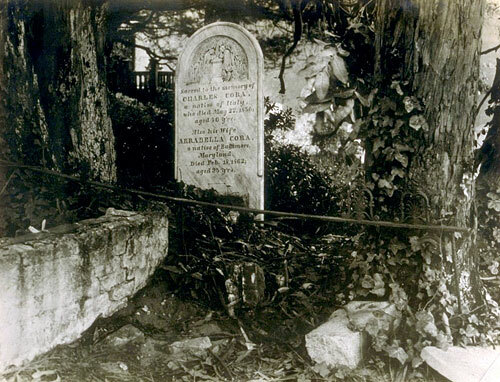 The original Lone Mountain Cemetery changes its name to Laurel Hill Cemetery in 1867. A century later, nothing will remain of all this: neither the builders of the West, nor the civic and military leaders, nor the jurists, nor the inventors, nor the artists, nor the eleven United States Senators. Only the Columbarium San Francisco Landmark 209, which was in the Odd Fellows Cemetery, will survive. Only the Columbarium and a plaque half hidden by a hedge. Eight years after I wrote the preceding paragraph, I returned to this site to find that the plaque no longer survives. United States Senator David C. Broderick was buried in Laurel Hill Cemetery after being killed in a duel with David S. Terry, Chief Justice of the California Supreme Court. The site of the duel is commemorated by California Historical Landmark 19 in San Mateo County. It was a popular place for family outings, Laurel Hill, with its rambling pathways, grassy valleys and slopes, flowers, woods alive with warblers, and hidden springs. By 1900, when city officials halted further burials, 38,000 of San Francisco's past figures and founders lay in its grounds, including Hugh H. Toland, one of UCSF's founding fathers. But the land became too valuable to remain a mere resting place, situated as it was between a pulsing young port city and the younger, still growing residential district of the Richmond. Real estate developers were offering top prices to city administrators who, in 1912, evicted all dead from the premises. The three adjoining cemeteries - the Catholic, Masonic and Odd Fellows - moved on without a fuss, but the fight to conserve Laurel Hill's pioneers for posterity went on for another 30 years. Finally, in the 1940s, the movement to create a Pioneer Memorial Park was quelled for good. All remains were unearthed and removed -- mostly southward to Colma's Cypress Lawns. Headstones grand and small were recycled into sculptor's blocks, gutters for Buena Vista Park and breakwaters along the Marina shores. 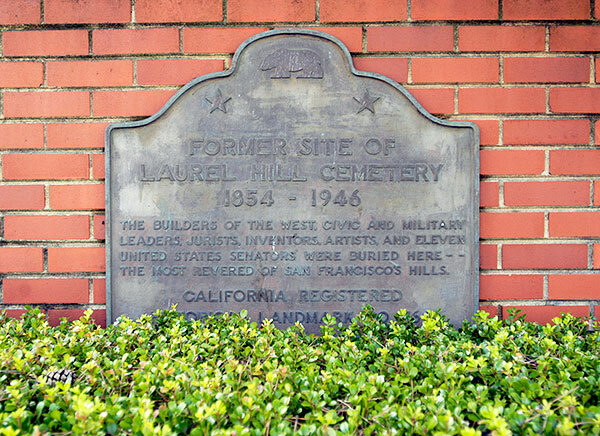 By the end of World War II, Laurel Hill had been subdivided for housing except for a parcel on Presidio Avenue between California and Bush Streets. The City planned to build a school here, but plans changed and The City sold the property to Fireman's Fund Insurance Company in 1953. Fireman's Fund built an office complex in the popular International-Suburban-Office-Park school of architecture, sort of a Crown Zellerbach building taking a nap on the grass, and occupied it in 1957. 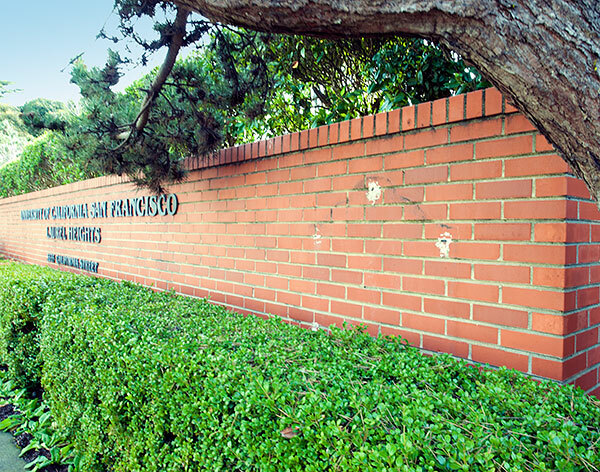 When Fireman's Fund fled for the suburbs in 1985, they left their building behind, and it was purchased by the University of California, San Francisco (UCSF), one of the world's leading biomedical research and education institutions.